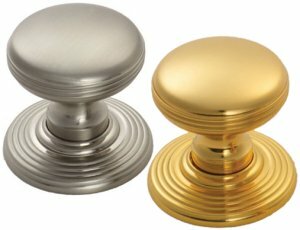 Solid brass Delamain ringed cupboard knob available in 28mm & 35mm diameter sizes. •Knob: Diameter 28mm. Rose: Diameter 30mm. Projection: 29mm. •Knob: Diameter 35mm. Rose: Diameter 38mm. Projection: 36mm. Available in Polished Brass, Polished Chrome, Matt Satin Chrome, Satin Nickel & Florentine Bronze.